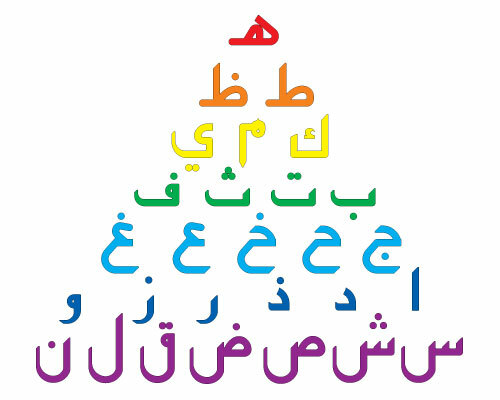 abjad's transforming and connecting plastic letters TM, write-on and wipe-off picture books, audioCDs, animal pop-out cards, and our bilingual CD-ROM packed with exciting educational games. Red letters: The letter "Ha" is unique among the letters in its complexity and variety of forms. In the Abjad system, she is the “queen” of all the letters. Orange letters: Like the indigo letters, these letters have no “tails”, but unlike the indigo letters, they have "hands" to help them hold onto other letters. Yellow letters: These letters join to following letters and each has a unique “tail” when found at the end of a word. Green letters: These letters join to following letters and have horizontal “tails”. Blue letters: These letters join to following letters and have deeply curved, backward pointing “tails”. Indigo letters: These letters can not join to following letters since they do not have "hands"..
Violet letters: These letters join to following letters and have deeply curved, upward pointing “tails”. Letters with hands can hold a following letter, or a 'tail' when at the end of a word. The letters are grouped into seven groups. Each group is represented by a rainbow colour. of the rainbow. © 2000-2016 Abjad Ltd. All rights reserved.